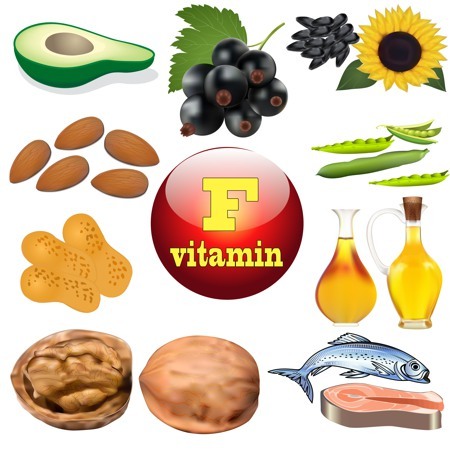 What Does Vitamin F Do For You? It is made up of two fatty acids- Linoleic Acid (LA) and alpha-Linoleic Acid (LNA). Essential fatty acids are sometimes referred to as Vitamin F. EFA’s are of two basic categories- omega-3 and omega 6, which include linoleic acid and gamma-linoleic acid. The body cannot manufacture essential fatty acids and so they have to be derived from food. The recommended dietary allowance of EFAs for adults is 1-2% of the total daily caloric intake. Their primary function is to repair and create tissue in the body. It brings suppleness and a youthful appearance to the skin. Hair becomes more shiny and healthy. Stimulates the growth of the beneficial intestinal bacteria. Supports the nervous system, cardiovascular health and circulatory function. Stimulates the conversion of carotene into vitamin A.
Soyabeen, safflower, and corn oils are good sources of linoleic acid. Flaxseed oil is the best source of alpha-linolenic acid. Sunflower seeds are best nut and seed source of linoleic acid. Fish such as salmon, tuna, and halibut are the rich source of omega-3 fatty acids. A decrease in efficacy of immune system which results in slow healing and increased susceptibility to infections.